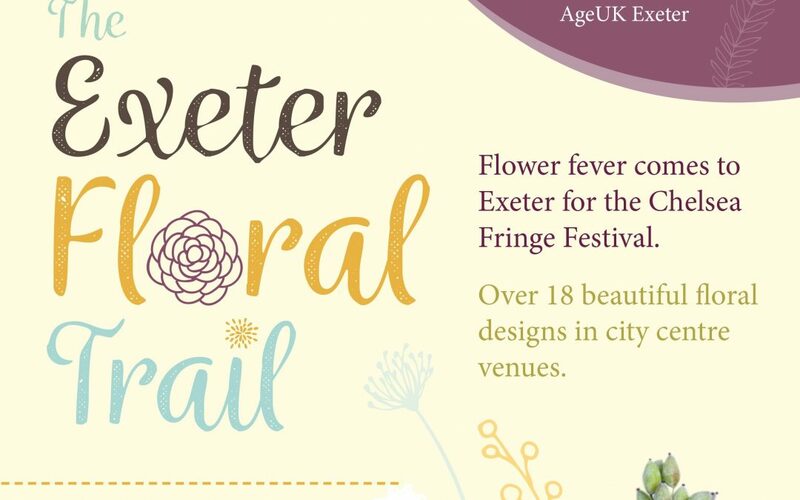 As the world goes flower-crazy with the start of the RHS Chelsea Flower Show later this month, Exeter is set to get its own exciting touch of floral glamour with the launch of the first ever Exeter Floral Trail on 22-24 May. Visitors to Exeter over these special 3 days will find unique floral designs created by tutors and students at the British Academy of Floral Art in the retail outlets of Build-a-Bear, Caroline Charles, Cath Kidston, Crafty Cakes, John Lewis, Lloyds Lounge, Mantis, Music Unlimited, Waterstones, White Stuff as well as AgeUK Exeter. Some displays will feature in store windows and on view day and night, whilst others may nestled within the venue and accessible only during opening hours. Exeter’s historic venues are participating with designs to be installed in St Nicholas Priory, Exeter University and in the grounds of Exeter Cathedral. The city’s retail florists are backing The Exeter Floral Trail initiative too with their own Chelsea Fringe Festival displays at Trugs Florist, St Leonard’s Florist, Jane’s Florist, Dunstan’s Florist and Blooms Florist. The Exeter Floral Trail will make stunning Chelsea Fringe Festival selfies, and visitors will be encouraged to post their images on social media using the hashtags #exeterfloraltrail #chelseafringe2018 #britishacademyoffloralart.